Jacquelyne Leffler, a farmer near Americus in Lyon County, reported that high humidity has inhibited their cutting over the last few days. While Leffler started harvesting on Saturday, she estimated that Leffler, Inc., will wrap up cutting with three ‘big days’ of work. Yields have ranged drastically for Leffler. Their top field so far has averaged more than 75 bushels per acre, with fungicide and well-timed sprinkles. Well-timed doesn’t mean copious, however, since that field saw only 9.6 inches of rain since it was planted. Other fields have averaged 63, 52 and 36 bushels per acre which supports that well-timed precipitation can make a world of difference. Test weights have ranged from 61 to 62 pounds per bushel. Proteins for the Lefflers are running about 12 percent, a bump from recent years. Justin Knopf, a Gypsum farmer, reported an overall low average yield with a range between the low 30s to mid 40 bushels per acre. 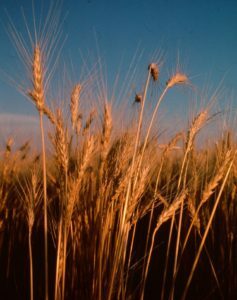 Knopf said that he was disheartened at the lack of rain this year, but estimated that his fields were about eight inches below average rainfall. Proteins in Knopf’s area will be ‘exceptional,’ reported Knopf. He said that the average range for many of his fields has been 14-15 percent. While the lack of rain has put a damper on this year’s harvest for the Knopfs, Justin remains hopeful for the time spent in the fields.